Any emulator that has 3D accelerator? Post subject: Any emulator that has 3D accelerator? Hi again, first of all, thank you so much to all those who helped me change the processing speed reported in Sheepshaver recently. The new build allowed my game to work and I am so happy. I was trying to play a game (M&Ms: The Lost Formulas), which runs on Mac OS 9 but needed a 3D Accelerator card. I know that Sheepshaver does not do this. I tried the game and it gave me an error message saying the 3D accelerator could not be found. So, I am wondering if any other emulators are capable of playing this with the 3D accelerator, or is this not supported at all? I have read that it has to do with underlying system hardware, but my MacBook Pro should have this capability because I've played other 3D games on it. The game also runs in Windows, so I've been trying to run it in Crossover, but my disc image only has the Mac-compatible installer (no .exe files). My host machine is a MacBook Pro with 10.11.6, El Capitan, Intel HD Graphics 4000 1536 MB. Any help would be greatly appreciated! Sorry for lack of knowledge, I am new. Post subject: Re: Any emulator that has 3D accelerator? I'd recommend the hybrid version from the Macintosh Garden run in WineSkin (Crossover's a bit dated). There is some slow work being done on creating 3D accelerator emulation for QEMU, or at least accelerator passthrough, but there's no emulator that's currently got support. That said, some OS 9 software was tied strongly to ATi Rage or Radeon cards, and later versions of OS 9 broke compatibility. Thankfully, most software that required hardware acceleration under OS 9 either have a Windows version that runs with DirectX or have been re-written since then to work under OpenGL and OS X (or iOS). Thank you so much, that info was very helpful. I found the hybrid image on mac garden and downloaded it, along with wineskin. The game installed completely, but then gave me an error saying "Insert game disc" when I chose to play it. I tried it on Crossover with the same error. I feel like there must be some way around this. Do you know if there is any way to connect the hybrid iso image with the wineskin wrapper so it recognizes it as a disc? Or, do you know of any alternative method I could try? I noticed in winecfg that there is a tab for "Drives," where it lists my computer's drives. Do you think I should try mounting the disk image on my computer and then linking it as a drive?? Yeah; I think for Crossover and Wineskin, mounting the disc on the host would be the way to go. You might try the usual virtualisation engines too, but thats needs a full OS running. 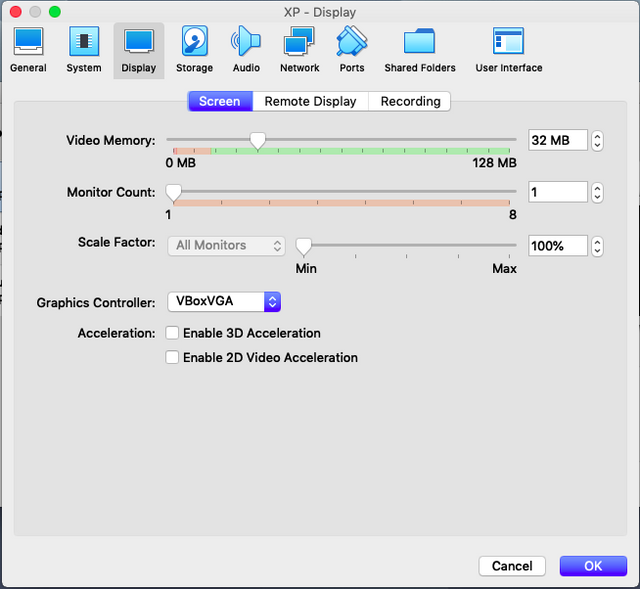 Virtual Box 6 has some kind of "hardware acceleration", VMWare Fusion offers DirectX 9 / 10 for some time longer even. Either way, these features are executed on your CPU - keep an eye on the core temps. I've been playing around a bit with VBox 6; be careful of the SVGA device in the Graphics Controller dropdown; it tends to do funky things with many guest operating systems; I've had it bail with Windows 7, Windows 10, OS X 10.4 Server and OS X 10.6 Server so far. Thank you all for the help. I have never done a virtual machine before, so I may look into that. I’ve tried mounting the hybrid disk image on my host machine, it gets listed as a drive in wineskin and crossover and I put the type as CD rom, but I still get the Insert Disc error; however, I think I know why. The hybrid disk image i downloaded had only mac-compatible files until i used The Unarchiver on it, which then turned it into Windows executables. However, it then became a folder, so I couldn’t mount it as a drive. I am going to try using my disk utility on my mac to make a .cdr image from the folder, and see if that retains the .exes. If that works, I’ll try mounting it and listing it in Wineskin and then running the game. If that fails, I may try the virtual machine. Thank you again for all your help. Hi everyone, sorry it's been a while since my last post - I went back to university and got very busy! 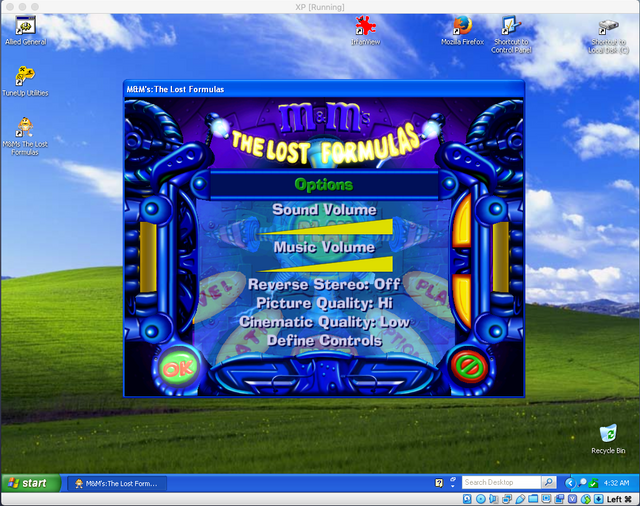 If someone could help me run M&Ms: The Lost Formulas in Wineskin, I would greatly appreciate it. I am not very familiar with Wine and have not found great videos online to help. My problem is the "Insert Disc" error that I get when I run the startup executable for my program. I run the setup.exe first, so it is installed in the C drive. but when I run the startup.exe in the wrapper, I get the "Insert Disc" error. One of the users who replied to this forum told me to mount the disc image I have on my computer first (I have the actual game cd, so my Mac OSX made a .cdr image from that, and I also have a hybrid iso image from the web). I have tried mounting both and choosing the d/ drive where they appear in wine.cfg. I put it as the "CD Rom" drive and apply the preferences. Still no success. I know I am probably missing a major step here, but I just have no idea where to mount the disc image (right now, it shows up on desktop) or how to get wine to recognize that it is there, so that it stops prompting me to insert the actual disc. Also, as I mentioned a long time ago, the hybrid image from the internet didn't have any Windows-compatible .exes until I unzipped it with The Unarchiver on my mac: then, it became a folder with the .exes, but it is a folder, not a disc image. I made it a .dmg disc image with my Disk Utility app and tried mounting that on my desktop, then selecting it in the wine.cfg (it showed up as a new drive, drive E) and checking the "CD Rom" option and applying the settings, but I still got the error when trying to start the program. Can someone help? Thank you. Sorry this is so late. is indeed a hybrid CD with both Windows and Mac partitions. The Mac side will remain "useless" unless you own a matching iMac G3 or until Qemu for MacOS 9 gets a full featured ATI Rage support or similar. The Windows side of the CD is quite usable once you set up Windows e.g in VirtualBox on your Mac. "Insert" the game CD and run the installer. As you will notice, guest OS in VirtualBox is Windows XP. Windows 9X flavours should do too, as the game was made for them, alas Windows 98 wont work well with VirtualBox. If you wish, I´ll send a link for the XP virtual appliance via PM. For Mac or PC the game has to be installed from CD and the CD has to be inserted during game play. Again, if you choose running such games in a virtual machine, keep an eye on your Mac´s core temps. As long as the guest OS does not use the Macs GPU, graphics have to be emulated by software. The GPU emulation produces considerable workload on your CPU. In my example, temperature jumped up instantly and the fan started blowing. Thanks so much!! I have never used virtualbox before, but will try to learn how to do it. I own the actual CD rom for the game, thankfully. I own a MacBook Pro without a built-in disc drive, but I have an external one I plug in through USB, so if I put the game in that, will it work? Do I install the game on the virtual machine from the hybrid iso and then insert the actual disc to play it? Also, is there a risk of the software harming my host machine if the core temp gets too high? Thanks. And yes, I would appreciate if you could PM me this link. I own a MacBook Pro without a built-in disc drive, but I have an external one I plug in through USB, so if I put the game in that, will it work? Do I install the game on the virtual machine from the hybrid iso and then insert the actual disc to play it? If I'm not mistaken, there is nothing you can do with the actual disc that you cannot also do with the hybrid iso. I would expect that if you access the hybrid iso image with a Windows program via Wineskin, or if you mount the image in a virtual machine running Windows, then it should be able to see the appropriate Windows data.